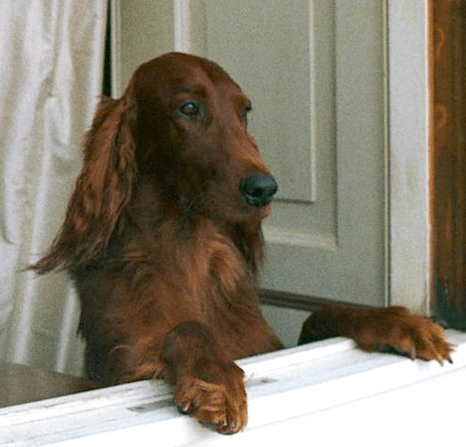 President Richard Nixon’s lovely Irish setter, King Timahoe, had a bit of a sweet tooth. A fascinating clip from the NBC Evening News on Jan. 9, 1974 shows the dog sneaking a large piece of the cake during a small surprise party for Nixon’s 61st birthday. The dog’s sneaky move in front of the camera apparently befuddled the president, because the footage next shows him with frosting all over his jacket. King Timahoe, hamlet in County Kildare, Ireland, where Nixon’s ancestors were from, was a gift from Nixon’s staff in 1969. The staff members had first given Nixon a small model of an Irish setter as birthday gift to represent the puppy to come in a few weeks. 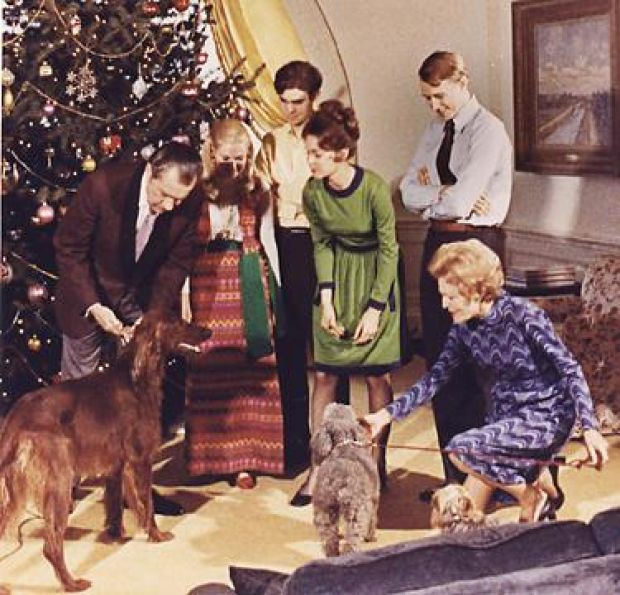 When it comes to dogs, Nixon is usually associated with the cocker spaniel Checkers because he included the dog in a famous televised speech when he ran for vice president in 1952. Checkers never lived in the White House, however. The family arrived at the mansion with two dogs: daughter Julie’s French poodle, Vicky, and daughter Julie’s Yorkshire terrier, Pasha. King Timahoe gets a treat from President Nixon for the holidays. Timahoe was born in July 1968. King Timahoe, or Tim as he was called, appears to have gotten along well with the smaller dogs. The three of them lived in a heated enclosure and dog run located just behind the West Wing. 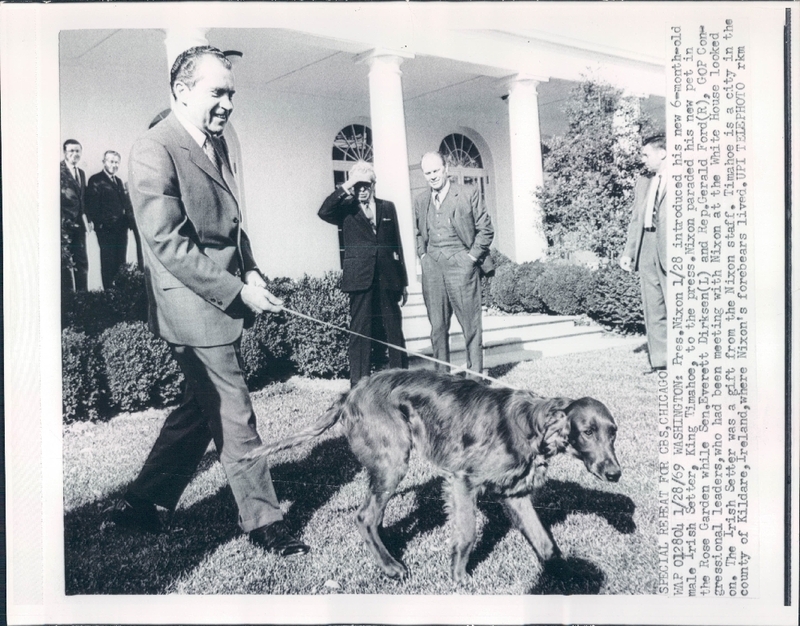 Traphes Bryant, who handled the dogs, reported in his book Dog Days at the White House that Nixon’s daughters visited the dogs frequently, and that he was often asked to bring the dogs inside to the family. The president enjoyed watching the dogs play on the White House grounds, and he told Bryant that he found them to be relaxing. In his book, Bryant mentions a time when King Timahoe went into a full pointer position — body taut, nose stretched outward, one paw raised — as he focused on a bird in a nearby bush. Bryant said Nixon himself stood nearby completely still for about 10 minutes watching the scene until the bird flew away. Tim could shake paws on command and enjoyed doing so. The good-looking dog provided a popular photo opportunity for visiting dignitaries and heads of state. King Timahoe lived to be 11 years old; he died in 1979.